In our application, we can create a new thread and leave a reply to any thread. We can also delete any thread or reply based on permissions allowed from the policies we had configured. Now we want to be able to edit a reply. Instead of deleting a reply entirely, we want to be able to just click a button, fix any text that we might not like, and then quickly save that edit. In this tutorial, we will use VueJS and textarea binding to create a reply component that will allow us to do just that. 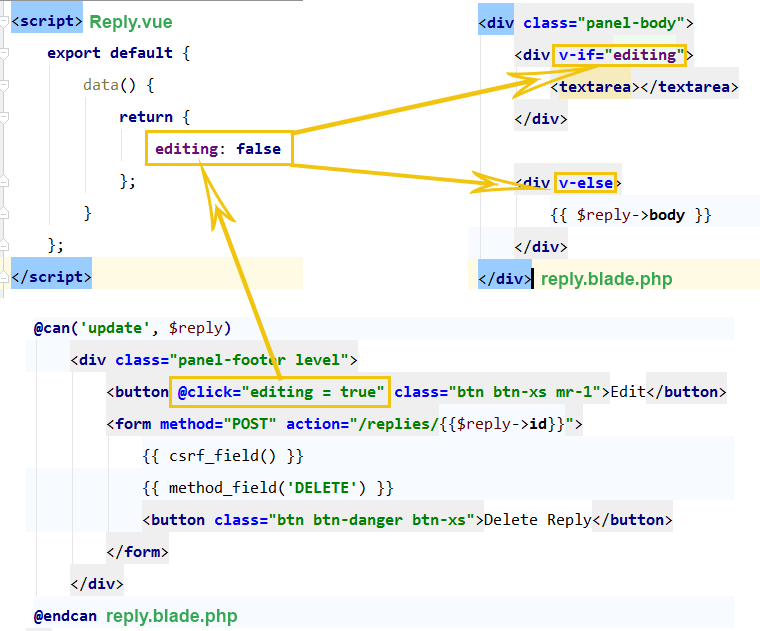 Beginning in the reply.blade.php view file, we will start by adding a simple edit button. 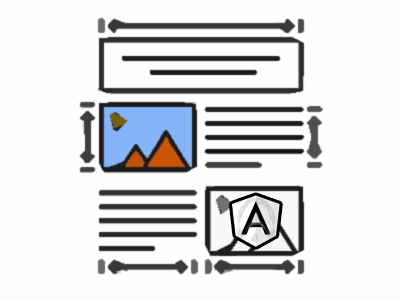 The goal is going to be that when a user clicks the edit button, the area seen highlighted below will morph into a text area where the user can update the text, and then send an ajax request upon completion to save the changes. This way there are no redirects and so on and so forth, making the edit action a very seamless experience. There are a few ways to set this up, but what makes sense here is to use a Vue Component but to make the template for that component inline. What that means is we’re kind of wrapping the existing view file right inside of a component. The markup for that looks like so. Loading the page in the browser would break at this point. You would see a message of “app.js:32407 [Vue warn]: Unknown custom element: – did you register the component correctly? For recursive components, make sure to provide the “name” option. (found in )”. That is because we still need to actually create that reply component. Now we can begin the process of registering and creating the <reply> component we need. In your IDE, you can visit resources/assets/js/app.js and add the new component. Notice that now we are registering two Vue components. You can see the registration for the flash component that we created in the example component tutorial. Now you are safe to create the Reply.vue file within the components directory like so. The very first thing in the <script> of the component that we complete is to export the Vue instance. Now with just the skeleton of the component in place, the error message we were seeing in Vue dev tools is cleared. When we click on the edit button, we want to somehow turn on the ability to edit. To accomplish this, we can attach an event listener to the button element in the view file. The markup here says, when the button is clicked, we want to set an editing property to true. 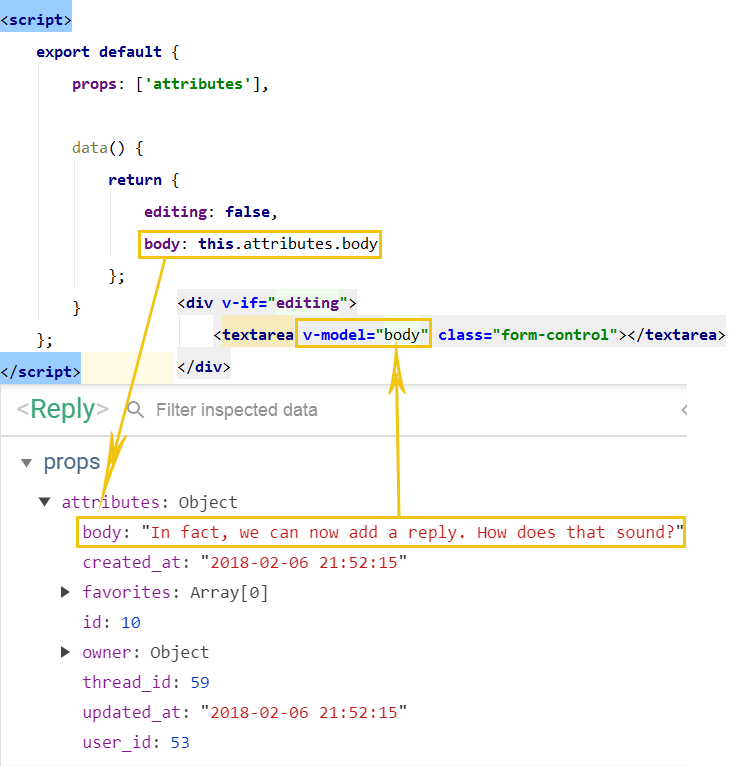 Now, within the panel area where we display a reply, we will use both the v-if and v-else vuejs directives to determine if we will show one <div> or a different <div>. So below, if editing is true, then we see a text area. Otherwise, we will see the standard reply text of the reply on the page. If a user clicks the edit button, the editing property gets set to true, and like magic we see the text box. Very cool! We can see the relationship of how this works in this diagram as well. 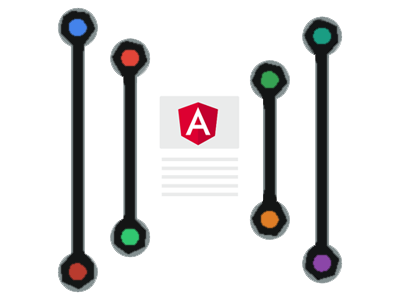 A requirement you will almost always need is to be able to pass attribute values from the HTML side back into the Vue instance. This is done via props. In our case, we want access to the data held in the $reply variable from the Laravel side. How do we do this? Well, we are going to echo out the $reply to populate the value of an attribute in the HTML itself. We then set up the props property in the Vue instance to accept whatever is held in the particular attribute we are dealing with. In our case, we named the property attributes. The Vue instance will now be updated as well with props. With the plumbing in place, Vue now has full access to all the data contained in the $reply variable. By opening up Vue developer tools, we can see that the <Reply> component now has that data. You will also need to be able to take data that is contained in the Vue instance, and use it to populate markup on the HTML side. This can be accomplished with v-model. For example, when we click on that edit button, a textarea is being presented. The textarea is blank however. What we actually want is the text of the reply so we can edit it. Well, now that we have access to that data right inside of Vue, we can bind it to the textarea with a v-model. Here is how we will do it. Now we bind the data contained in the body property of the attributes object like so in Reply.vue. The result is that now when the edit button is clicked, the text area is displayed. This time however, since v-model is in place and is looking for the data contained in the body property, the textarea gets populated with the text we are interested in as well. Again, very slick! Another diagram shows the relationship for v-model to data in the Vue instance. So you clicked the edit button, but you have decided that the reply is actually just fine. You don’t need to update anything, you just want to cancel the editing process. All you have to do is set the editing property back to false, and the editing textarea no longer displays. So we can add a button like we do below, set the @click event to assign the value of false to the editing property when it is clicked, and like magic once again the UI updates very quickly. There needs to be a button to actually save any changes you make if you decide to edit the text. We can add the markup as follows which says, when you click this button, call the update() method on the Vue instance. We have not yet created that method, but we will in a minute. Now we get to the fun stuff. 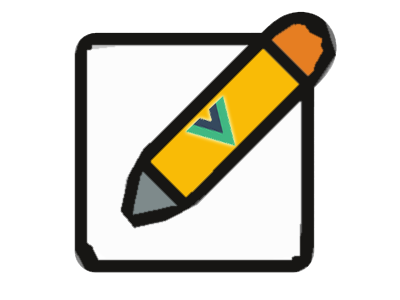 We need to take action when calling the update() method in Vue. What do we want to accomplish? Well, we want to save the data associated with the v-model back into the database via an ajax request to Laravel. The Vue code is ready to go. When we click on the save button, it triggers the update() method on the Vue instance. That method as we can see above, fires off an ajax request using axios to the replies endpoint with the id of the reply as a wildcard. In addition, the payload sent is the body property which contains the updated text entered in the textarea. This endpoint does not yet exist on the Laravel side, so we need to set that up. First we can set up a new test in our ParticipateInForumTest class. Then we can add the proper route to our routes file in web.php. And finally, we can add the update() method to the RepliesController. Running the test shows we are good to go. We should also add a test for unauthorized users. We do not want them updating replies they should not. So for this, we’ll need to also make use of the policy we had created during this series. This will make sure only authorized users can update a reply. 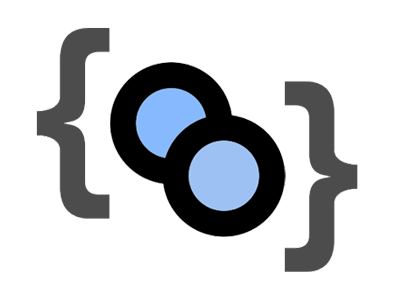 Rest assured, the code above will update the database via the ajax request we are making. Now, we want to make sure that we see the updated reply immediately without the need for a page refresh. How to do this? Inside the update() method, once everything finishes, then the editing property should get set back to false. We can also add a quick call to the flash() function so that even though there is no full page reload, a flash message will still appear. What that does is cause the v-else to trigger in the view file once the update() is complete. There’s just one problem however. The contents of the body are echoed out via Laravel and that is the text prior to editing. We don’t want to see the old text, we want to see the new updated text. That means we should not be manually populating the HTML, we should have Vue populate the HTML dynamically via it’s binding abilities. If we change this markup to use v-text like so, then we should be good. It looks like editing in real time with no page reload is in fact working great! You might notice if you are following along that when you reload the page, the textarea is loading kind of oddly. Watch the textarea as we manually reload the page. Not good. v-cloak allows you to add an attribute to an element until everything is fully loaded. It kind of reminds me of like when you put all your jquery in a .ready() function and tells the code to hold off until this page is fully loaded and ready to go. So what we want to do is actually just not display the element as the page is loading. This is what is causing that odd element jumping on the page. So at the very top level of the component, we’ll just add the v-cloak directive like so. Now, as things are loading, the dynamic component will not even be displayed. When loading is complete, Vue will automatically remove that bit of css defined by v-cloak and you will see the element on the page with no artifacts or page jumps. This was a fun and pretty involved tutorial. 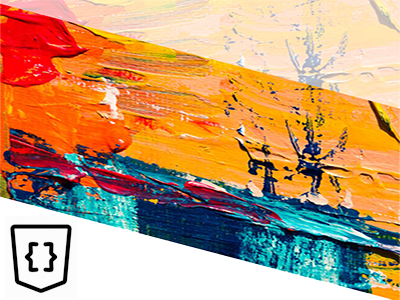 We saw exactly how to work with VueJS in the browser in concert with Laravel acting as the API on server to create real time page editing and updating with no need for any manual page reloads. This gives the end user a really smooth and slick user experience, and was quite fun to set up for us the developers.